Today is National Handshake Day. It's one of our most common greetings between two people. The gesture originated back as far as the 2nd century B.C. It was meant to show that your hands held no weapons. Today you are encouraged to use the handshake to greet people. At a brewery, you can also use the handshake to grip a pint of your favorite beer! The handshake is also part of the logo for Our Mutual Friend Malt & Brew in Denver. Here's what's happening around the Colorado beerosphere today Thursday, June 27th, 2013. Dad & Dude's Breweria (Aurora) - Their Speakeasy Club program (aka "The Leagues of HOPstraordinary Ladies & Gentlemen") is changing starting July 1st. Points will now get you much much more! Rack up your points and use them to buy yourself a meal or swag. And THE BEST part of the new program, entry into The League of HOPstraordinary Ladies & Gentlemen. Receive complimentary entry into the club which comes with a pretty fancy 22oz stein that can be filled for the price of a pint! Also, membership will be required for participation in a great new offering coming late Summer, FIRKINS! Colorado Brews (TV Show) - If you missed the original debut of the new reality TV show "Colorado Brews" on Rocky Mountain PBS in April then you'll want to know that the show will be repeated on Thursday, July 25th at 9:30pm MDT on Rocky Mountain PBS. The show was recently picked up for a 13-episode series and will begin taping in August. The show is all about the Colorado craft beer industry and will feature segments on Colorado brewers, festivals, taprooms and more. The series will begin sometime this Fall or early Winter. Follow the latest on their Facebook page. Odyssey Beerwerks (Arvada) - The new stainless steel growlers are in! But to get one you need to be a member of their Adventurer Club. Not a member? Not a problem, come to the brewery and sign up while spots last. Existing members can pick theirs up today. Great Divide Brewing Co (Denver) - In a press release today, Great Divide revealed that their third quarter line-up of season beers would be coming out in July. Among them are: Great Divide Oatmeal Yeti, Great Divide Rumble Oak Aged IPA and Great Divide Wolfgang Doppelbock. Rumble will be available in 6-packs while Oatmeal Yeti and Wolfgang will be offered in 22oz bomber bottles. Kegs are also available of all three. Oatmeal Yeti replaces Belgian Yeti in their Yeti Imperial Stout series. Epic Brewing (Utah/Denver) - According to their recent newsletter, back on June 19th, Epic Brewing brewed up their first batch of beer in their 2nd brewery location in Denver. Their 1st beer was their "Escape to Colorado IPA". They wanted to give their new brewing system a good shakedown and they'll be working out the kinks over the next few weeks. But you'll need to wait a while before you can visit their new taproom. Their doors won't open until September 2013. Wit's End Brewing (Denver) - Don't forget! Tonight at 6:00pm is the tapping of their collaboration beer with Renegade Brewing at 6pm at Wit's End. It's the return of "Judge Whoppner" - a beer brewed with malted milk powder. It's like Whoppers in a beer! The Judge weighs in at 9.7% ABV. Get some while it lasts. Avery Brewing (Boulder) - Attention beer geeks and Avery fans. 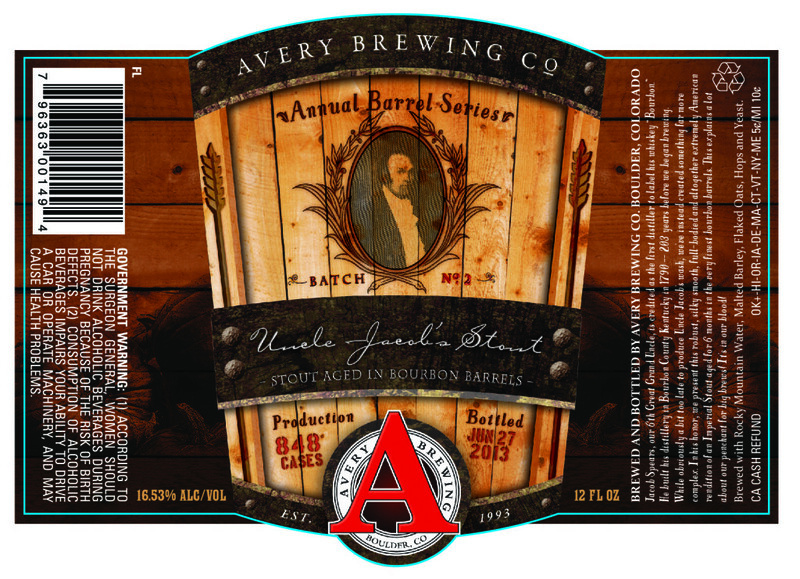 The next release of Avery's very popular Uncle Jacob's Stout is set for Sunday, July 7th at 5:00pm. This big 16.5% bourbon barrel-aged stout is packaged in individual 12oz bottles. The Line Party will begin at 11am and bottle sales begin at 5pm (yup a 6-hour wait). Buyers will be limited to one case (24 bottles) at $12 each. The line party at 11am will feature rare and exclusive beers as well as some bluegrass music to entertain you. Fans will also be bringing their own bottles to share and possible use as swap materials for these bottles. Save your pennies and wear comfortable shoes - you're going to need them! FATE Brewing Company (Boulder) - What are your plans for the 4th of July? Come celebrate The Fourth at Fate. They'll be tapping a brand new beer "Red, Wit and Blue". You can get $4 FATE Core beers all day long. There will be smoked Chicago dogs and All-American Clubs available - plus you'll get a great view of the fireworks from the brewery. Come party! Wiley Roots Brewing Company (Greeley) - Greeley's next new brewery just got some good news. Wiley Roots finally received their "Occupancy Load Certificate" from the City of Greeley. They've been approved for up to 87 people to be present in their brewery building. This means one thing - they will be opening for business very, very soon! They would become Greeley's third brewery behind Crabtree Brewing and Pitcher's Brewery & Sports Shack. A 4th brewery is in the works - Broken Plow Brewery is targeting opening later this year. Look for word on Wiley Roots Brewing Company's opening soon. Verboten Brewing (Loveland) - Yes, it's been extremely hot lately and the taproom has been hot as well. But good news! They have just installed a new swamp cooler and now cooler air is circulating in the tasting area. Just in time as today's heat may set a record. The beer has always been cold, but now the air will be a bit cooler as well. Have you tried their Strawberry Rhubarb Wheat yet? Knockin' Rocks Brooms & Brewfest (Ft. Collins) - The new beer festival is this Saturday, June 29th! You can still get Online discounted tickets until Friday. The event will be held at 7900 Fairgrounds Ave just outside the NoCo Ice Center. Look for the big white tent! Visit www.knockinrocksbrewfest.com for info and tickets. This is the last day to get discounted tickets! Festival runs from 12pm to 5pm. Also stop inside the Ice Center for demonstrations on the sport of curling! The Mayor of Old Town (Ft. Collins) - Join in for a special tapping this Friday (6/28) at 5:30pm! The Mayor will be tapping their latest collaboration beer which they brewed with Black Bottle Brewery. The beer is a Belgian Saison infused with Earl Gray Tea. It's @ 6.8 ABV, IBU 27 IBU made with Belgian Pale, Crystal 10-15 malt & Hersbrucker Hops. The beer is called 'Mother Should I Trust the Government?' and was brewed in conjunction with our women's beer club the Beer Bettys: The Mayor's Ladies Only Beer Club! Echo Brewing Company (Frederick) - Thursday means Ladies Night at Echo Brewing. Ladies get half price beer all day. There's also BBQ and live music at the brewery tonight as well. Ash Ganley will be playing from 7-9pm and the Shuffler Bros. BBQ will be on site. Pateros Creek Brewing (Ft. Collins) - On today's Outlaw Tap is a special collaboration brew with Go West T-Shirt Company that's a double pilsner that was made with Motueka hops and Star Fruit. A perfect brew for a hot day. Steamworks Brewing (Durango) - Their series of monthly firkin tappings continues on Friday, July 5th with a special "Piña Colada” brew. The cask will be tapped at 3 p.m. This beer uses their Hefeweizen as a base and then adds toasted coconut, pineapple juice and brown sugar. And to top it all off they'll put a maraschino cherry garnish on it! It will taste like a Piña Colada tropical brew. This is a limited batch so better get there soon after it taps at 3pm. Crazy Mountain Brewing (Edwards) - The brewery's "Scenic Route Kolsch" is back on sale once again for the summer. This light brew is available in 22oz bomber bottles and on draft. Summit County Breweries (Colorado) - The Summit Daily newspaper just compiled a list of favorite summertime beers produced in Summit County, Colorado in a recent article. These beers include: Backcountry Brewery's Imperial Saison, Breckenridge Brewery's SummerBright Ale, Dillon Dam Brewery's Dam Hefeweizen, and Pug Ryan Brewing Company's Crispi's Cream Ale. If you're heading up to the high country this summer you should stop in and try one of these brews. Check the article for more info on those beers.